I like old photographs, and I like looking for them outside of the narrow pantheon of museum-approved art photography names. If you share either of these predilictions, you might want to pick up a current bargain book, Neal McCabe's Baseball's Golden Age: The Photographs of Charles M. Conlon , for a mere $8.50, marked down from $20. That is, if you like baseball. 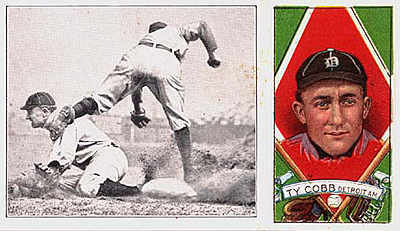 Conlon's most famous photograph is also one of baseball's most famous, "Ty Cobb Stealing Third," seen above in a cropped state. To see some of the Conlon pictures without buying the book, Sporting News has a Conlon Gallery page online—but the scans are pretty poor. Conlon, called "the greatest baseball photographer of his era," wasn't a professional photographer. He was a proofreader, for the New York World-Telegraph. That was his day job. Photography was his hobby (!). A quote of Charley Conlon's I just love is his description of how he got into his line of work: "[John B. Foster, Sports Editor of the World-Telegraph] said to me one day, 'Charley, they need pictures of ball players for the Guide and there is no reason why you can't take picures of players, as well as pictures of landscapes. It will be a good pickup for you, and it will be something for a day off.' "
Thus were legends born, in olden days.